Attorneys may garner most of the attention, but they are not the only people hard at work in the courtroom. Keeping our legal system running smoothly requires the contributions of many different types of professionals. They may not enjoy the high profile of defense attorneys or prosecutors, but all can have exciting and highly rewarding jobs. Anyone interested in pursuing a legal career should know about the positions and roles that factor into the day-to-day administration of justice. 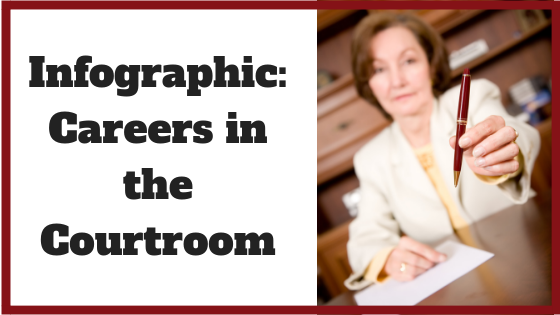 Many of these courtroom jobs require highly specialized experience. Therefore, they are in high demand and can command excellent wages. For example, court reporters are responsible for recording all of the proceedings during cases. They must use special equipment and have exceptional concentration. Paralegals assist attorneys in preparing for court by, in part, researching precedents. Interpreters are needed to translate for defendants, plaintiffs or witnesses who are not fluent in English. None of these positions involve arguing in front of a judge or jury, but they all are vital for proper functioning of our legal system. If you’re interested in being part of the justice system but don’t necessarily want to go to law school, see the accompanying infographic. It contains more details about careers in the courtroom and what you would need to be qualified.